In this still tepid recovery, the biggest feel-good story has been the resurgence of American manufacturing. As industrial production has fallen in Europe and growth has slowed in China, U.S. factories have continued an expansion that has stretched on for over 33 months. In April, manufacturing growth was the strongest in 10 months. There are a number of reasons for this revival. Rising wages in China – up from roughly one-third U.S. levels to half that in a decade — and problems associated with protection of trademarks and other issues have led many U.S. executives to look back home. Some 22% of U.S. product manufacturers surveyed by MFGWatch reported moving some production back to America in the fourth quarter of 2011, and one in three said they were studying the proposition. Certainly how long this expansion can last is an open question, particularly given weakness in Europe and the slowdown in formerly fast-growing developing countries. But one thing is clear: the industrial resurgence is reshaping the economic and employment map in often unexpected ways. Now rather than being pulled down by manufacturing, our Best Cities For Jobs survey, conducted by Pepperdine University’s Michael Shires, found that many industrial regions are benefiting from their prowess. From 2010 through March, manufacturers added 470,000 jobs and enjoyed a rate of job growth 10% faster than the rest of the private economy. In the past many areas suffered from having too many industrial workers. Now it looks like we will have too few skilled ones, even in hard-hit sectors like the auto industry. In 2011 there were 50,000 unfilled U.S. job openings in industrial engineering, welding, and computer-controlled machine tool operating, according to the forecasting firm EMSI. If the revival continues, this shortage could worsen. To determine the cities that are leading the manufacturing revival, we assessed manufacturing employment growth in the 65 largest metropolitan statistical areas. Rankings are based on recent growth trends, as well as job growth over the past five and 10 years, and the MSAs’ momentum (see the bottom of this piece for the full rankings list). In an era of excitement over the Internet, it is often forgotten that a majority of the country’s scientists and engineers work for manufacturers, and that industrial companies account for 68% of business R&D spending, which in turn accounts for about 70% of total R&D spending. Nowhere is this linkage between technology and industry more evident than in the Seattle-Bellevue-Everett area, which ranks first on our list of the metropolitan areas leading the manufacturing revival. Over the past year the region was No. 2 in the nation in manufacturing growth, with employment expanding 7.9%. The aerospace sector, led by Boeing, accounted for roughly half this expansion. The growth in aerospace and high-tech employment creates precisely the kinds of high-wage jobs, including for blue-collar workers, that are lacking in many parts of the country. In 2010 the average factory wage in the area was $64,925, up 9% from 2007. Most critically, manufacturing activity drives growth in other sectors of the economy. About one in six of all private-sector jobs depend on the manufacturing sector, and every dollar of sales of manufactured products generates $1.40 in output from other sectors, the highest of any industry. As manufacturing employment overall has dropped, the percentage of higher-wage, skilled industrial jobs has been climbing over the last decades, particularly in high-technology related fields Overall, according to EMSI data, the average American factory worker earned $73,000 in 2011, $20,000 more than the average job. 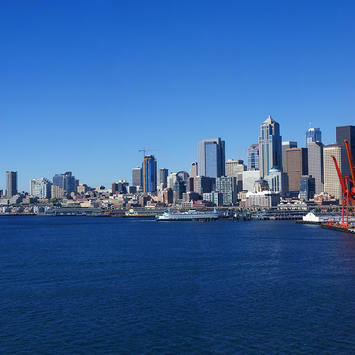 Seattle is not alone in creating high-tech-oriented industrial jobs. Over the past two years Salt Lake City, Utah, which ranks third on our list, has seen significant growth in both electronics and aerospace employment, including a new Northrop Grumman facility. Firms connected to the medical device industry such as Biomerics are also expanding in the area. Manufacturing is also rebounding in Austin-Round Rock-San Marcos, Texas, which ranks eighth on our list and No. 1 on our overall list of Best Big Cities For Jobs. Last year industrial employment in the Texas state capital area jumped 5%. Semiconductor firms are a big force, employing over 10,000 workers. Although more known for its high-tech electronics, Austin has also enjoyed an expansion in automobile-related employment as well as medical devices. The largest grouping of manufacturing stars have emerged from the Texas-Oklahoma energy belt. With the shale drilling boom unlocking ample supplies of natural gas and lowering prices, petrochemical companies have undertaken major expansions. The rise in drilling and exploration has also sparked greater demand for industrial products such as pipes, drill rigs and other machinery. No surprise that the biggest backers of shale gas exploration are prominent CEOs of industrial firms. A recent study by PwC suggests that shale gas could lead to the development of 1 million industrial jobs. The shale drilling revolution is making an impact across the country, in places like North Dakota and Youngstown, Ohio, but the epicenter of this boom remains firmly in the oil patch. The Thunder you hear in Oklahoma City is not just on the basketball court — energy growth has propelled a 1,500 person jump in manufacturing employment, a 6.1% increase, with another 1,000 new jobs expected this year. Oklahoma City ranks second on our list. Other energy capitals are also thriving on the industrial front, including Houston (fourth place), San Antonio (seventh) and Ft. Worth-Arlington (ninth). Although energy is the main driver, manufacturing has been on the rise in a broad array of areas, including aerospace, biomedical and food processing. The surging export economy — Texas is easily the nation’s number one exporter — has further bolstered this growth. The high-tech and energy economies may be fast-breaking in terms of industrial growth, but manufacturing’s comeback has put some new bounce in the step of many long forlorn parts of the nation’s “rustbelt.” Warren-Troy-Farmington Hills, Mich., epitomizes this trend. Unlike Detroit, which has suffered mass disinvestment, this more suburban area a half hour drive away has become the epicenter of a new, more tech-oriented auto industry. The Warren-Troy area’s rich concentration of skilled tradespeople and industrial engineers has been described as America’s “automation alley.” It continues to attract high-industrial firms from abroad such as Brose, a German car parts manufacturer, which has recently announced a $60 million investment in the area. Even housing is on the rebound, with rents rising at the fourth highest clip in the country, just behind such standouts as San Francisco and Miami. Nor is the Midwest manufacturing rebound limited to Michigan. Over the past year sixth-ranked Cincinnati enjoyed 5.4% growth in industrial employment. Manufacturing growth was also strong in Milwaukee-Waukesha-West Allis, Wisc., a center for the production of machine tools and other precision equipment that ranks 10th on our list. Of course not all regions have benefited from the industrial resurgence. For example, the nation’s largest industrial area, Los Angeles, ranks a miserable 49th. The area lost some 20% of its industrial jobs since 2006, and the losses continued over the past year. This goes a long way to explain the area’s continued underperformance before, during and, now, in the early days of recovery from the financial crisis. Some other large regions did even worse, including such one-time industrial powerhouses as Philadelphia (55th) and New York (59th). Some may argue that these, and other areas, which have been losing manufacturing jobs for decades, no longer need to engage in the messy business of making stuff. But that long fashionable way thinking may be outdated itself, as seen by the improving fortunes of our industrial top 10. The index is calculated using the same methodology as our Best Cities for Job Growth, but using only manufacturing employment in each region. Seattle waterfront photo by BigStockPhoto.com.